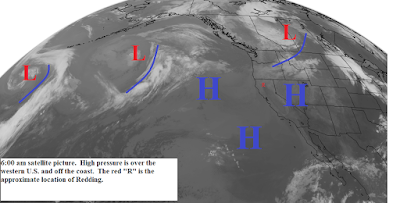 High pressure is building over the west coast and will hold there through midweek. The inland areas of Northern California will be mostly sunny and temperatures will be near normal today and about 10 degrees above normal by Tuesday. Light to moderate southwest to northwest winds will occur in the afternoons. Midweek the high will move a little westward as a low pressure trough develops over the Great Basin (see map below). Wednesday through the weekend most of the north state will continue clear but there will be some afternoon cumulus clouds along and east of the Sierra Cascade Crest. Temperatures will continue above normal. There will be gusty north winds at times as the low develops.